Airtrade Travel Singapore Pte. Ltd.
CheapTickets.sg is the best travel website to book online your airline tickets and hotels against the best prices. CheapTickets provides a wide selection of cheap flights and fares to worldwide destinations. All flights can be searched and booked directly online. Not only are full service airlines displayed, flights on budget carriers are also offered within the same search results. Everything can be booked and paid in 3 easy steps. Along with a wide selection of flights and fares, CheapTickets.sg provides you with the best deals on hotels. Whether assistance is needed before, during, or after booking, CheapTickets Customer Support Team is available to help with your questions 24/7. 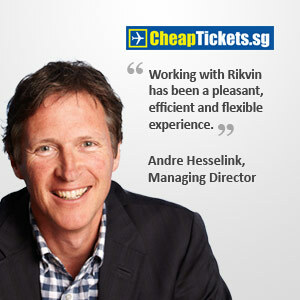 CheapTickets is part of the global online company, Travix, which is based in the Netherlands. Travix manages an extensive portfolio of travel-focused websites operating under the brand names BudgetAir, Flugladen, Vayama, and Vliegwinkel. Travix operates its five brands in 17 countries across The Americas, Europe and Asia; employs 600 staff; and has combined sales in excess of US$2 billion. Why did you set up in Singapore? The growth in internet penetration and internet travel penetration is going to happen in Asia in the the next few years so it is logical that the company wanted to offer its services to the Asian traveller as well. We choose Singapore as our regional head office because of the business friendly environment in Singapore. It is all well organized and for internet companies, it has the right infrastructure. Setting up an office here is much easier than in many of the other countries where we do business. What are your goals in Asia? Our goal is to expand rapidly in Asia. We just have launched the CheapTickets brand also in Thailand and Hong Kong and we are preparing to launch in India and China later this year. If all goes well, then on next year’s calendar are Indonesia and the Philippines. In all the countries where we launch, we aim to be a top 3 player by focusing on the traveller’s needs and localize our websites and products. What was your experience of Rikvin? Rikvin helped us register our regional headquarters in Singapore with no hiccups. We are also engaging them for a number of services including corporate secretarial and work visa services. We are impressed with the level of support delivered by Rikvin staff; they are professional at all times. Working with Rikvin has been a pleasant, efficient and flexible experience.